Note: A companion piece to this article. to be posted later this week, will examine the strategy and details in the structure of the awarded program, and how such a program may support the health creating mission of other CAM-IM practitioners and programs. Bernie Noe, ND, has experienced what may yet prove to be the ultimate CAM-IM tale of creating opportunity out of crisis. Two years ago he was volunteering with his professional association, Vermont Association of Naturopathic Physicians, on a bill which would have mandated inclusion of naturopathic services in insurance plans. The strategy was a "freedom of choice" initiative which said that if a service (exam, testing, treatment) was covered, then a policy holder would have the right to go to a naturopathic physician if that service was in the state's ND scope of practice. Among those opposing the bill was the Vermont Automobile Dealers Association (VADA). The VADA comprises over 171 businesses with roughly 6,800 employees, 100 of which, accounting for 2300 employees, participate in VADA's insurance trust. VADA, and several other employer associations, signed on to a letter opposing the mandate, asserting the mandate would increase the costs to their health insurance trust. (See IBN&R article on a federal level issues regarding mandates.) Noe met with VADA's executive director, counter-asserting that that naturopathic services would increase the health and wellness of their employees while saving them money. Neither had solid data to support their assertions. But VADA was sufficiently interested to engage Noe in a dialogue, and later a contract, to develop and deliver an employee worksite wellness program. 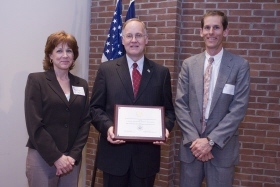 A mere 18 months later, that program was honored with a Gold Award for Worksite Wellness by Vermont Governor James Douglas. The program received a higher honor than competing entrants from established wellness prorgams at IBM, the Rutland Regional Medical Center, General Electric and the University of Vermont. Now, in a second phase, VADA will begin to test Noe's original assertion. In June, a network of naturopathic physicians will begin treating identified, high-risk and high cost VADA employees in a one-year pilot which will provide useful data in grounding the war of assertion between naturopathic doctors and payers. The naturopathic physician who made the cost-saving claim to the VADA executive director happened to have an earlier career designing phone systems for US West Cellular. Noe's background gave him the confidence to create the infrastructure for the wellness program. To create the program, he went to school on other wellness programs and crafted a project which included a health risk appraisal, elements of Stages of Change/Readiness for Change model developed by James Prochaska, and a group competition involving pedometers. (A related IBN&R article, to come, will describe the program and its outcomes in some detail.) he developed the program through his business, Green Mountain Wellness Solutions. Meantime, Noe maintained a passionate interest in showing the economic savings whichhe believes can come to employers through using services of naturopathic physicians. After graduating from Bastyr University in 1996, he served two terms on the board of the American Association of Naturopathic Physicians and left it with the intent to work with employers on this model. Says Noe: "That's may baby at this point." He would like to develop a successful program which could then be rolled out to other regions and other networks of naturopathic physicians throughout the US. The pilot is limited to 43 patients and a total benefit payment of $21,500 from the Vermont Automobile Dealers Association's health trust. Noe is comfortable with the size of the project: "The VADA trustees are very concerned about costs, as they should be, but I know from talking with (Marilyn Miller, VADA executive director), they are very excited about this pilot. They see it as part of the solution." Noe is nearing completion of his credentialing of his limited network of 10-15 naturopathic physicians. None have chaffed at the $500 benefit limit for the pilot. Noe indicated that those who are participating are comfortable that positive outcomes can be achieved within this limit. Consulting with research leaders in the naturopathic profession convinced him that attempting to impose a specific treatment protocol would be met with resistance. Patients will receive individualized care as determined by the individual ND. The outcomes strategy has not yet been fully developed. Noe feels the sample size will be too small for definitive research. He speaks of a potential follow-up with a larger employer group. He is hoping, this round, to work with Blue Cross of Vermont, which administers the VADA trust, to get both historic data for the 43 patients, and potentially comparative data from a matched group. However, Noe hasn't the funding to engage a more thorough research effort. Says Noe: "I don't think what we produce will be publishable. But I expect it will be useful in marketing." Noe knows that to have power, the outcomes must hold over a 1-3 year period. If successful, he envisions expanding the program to other employers, and networks. The potential value of this project to the emergence of the naturopathic medical profession, licensed now in just 14 states, and typically not part of the insurance system, has not been lost on Noe's national professional association. Noe shares that Karen Howard, the executive director of the American Association of Naturopathic Physicians (AANP) and AANP strategic consultant David Matteson "are both very excited about this." One sign of their excitement: It was Matteson and Howard who brought the story of Noe's award to the attention of IBN&R. Comment: The data won't be publishable -- but it will be useful in marketing. There is no more practical guide to fostering CAM-IM integration than this statement. Members of the scientific community will carry on about the importance of peer-reviewed and published evidence. Yet academic researchers and employers have distinct interests and codes by which they operate. Employers - whose benefit plan decisions directly, shape the health care options of millions of human beings - are more likely to read, and be moved by, industry-oriented cost data than typical JAMA fare. (We had an interesting dialogue on this topic at the Integrative Medicine Industry Leadership Summit 2000.) Employers are moved by such "marketing" information. It can be suggestive, helpful, clarifying and confirming. It can be guiding them to "part of the solution," to use Noe's phrase. Yes, producing this kind of evidence is not what will be likely to advance a typical academic health career. Nor will it be a tipping point in the health care practices of a nation. But it is evidence that can be a tipping point in the purchasing decisions of employers and payers and legislators in the communities in which CAM-IM providers, CAM networks and integrated clinics operate. As such, it can possibly also tip the economic outcomes of some integrated centers into the black - and the outcomes of individuals who can access new strategies for their own health. Noe's project is exceptional, exemplifying a direction for outcomes analysis which can truly be useful, relatively rapidly, in giving people more healthcare options. Congratulations to Noe and VADA for recognizing the opportunity and engaging an unusual series of projects. We won't create health from our disease-focused system by making the same old decisions - as clinicians, as researchers, as academics, or as payers and funders. I urge the AANP to back the work as it can. Should this pilot project prove positive, by the summer of 2007, the naturopathic profession may begin to have a ticket to ride.